Comments: "I wanted to make a 3-d map of the hill fort. So I started walking around in random squiggle shape hoping to capture a data cloud for a terrain model. And then all the batteries ran out in my GPS receiver. So I replaced them with some expensive copper-topped batteries. Let's start again, this time on full power. 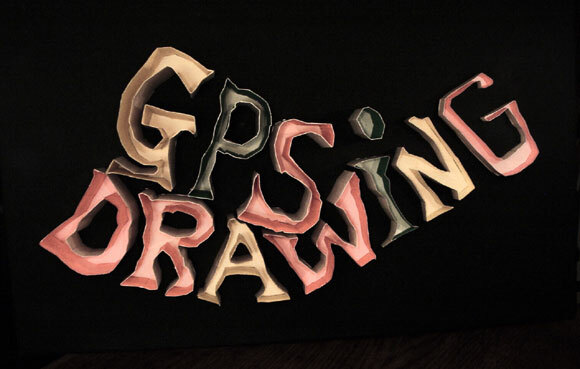 I belted around the perimeter of the field to assess the area of the canvas and figured that I could fit the words "GPS DRAWING" in the area. 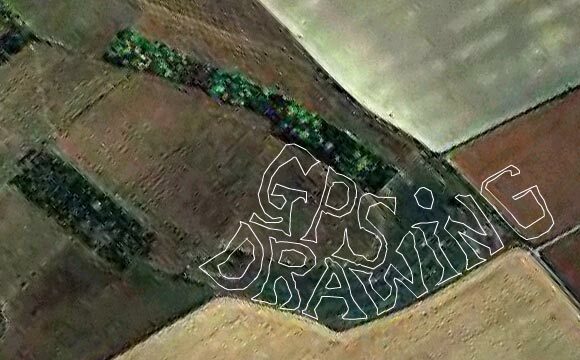 So after 3 hrs 7 mins and having carefully negotiated a herd of cows and billions of rabbit holes, I had written "GPS DRAWIN". Hmm... I never left enough room for the "G" at the end. So I waited until after sunset and sneaked in to the freshly planted wheat field and slightly trespassed out the final letter." Cardboard model, rollover image for ultraviolet lighting.